Hailed by the New York Times as “one of the greatest musicians in jazz history,” saxophone giant Joe Lovano has distinguished himself for some three decades as a prescient and path-breaking force in creative music. He has earned praise not just for his compelling saxophone tone and improvisational ability, but also for his forward-thinking presentation of new musical ideas and ensemble concepts. Streams of Expression, Lovano’s 18th album for Blue Note Records, unites disparate themes from his own discography, not to mention jazz history as a whole. 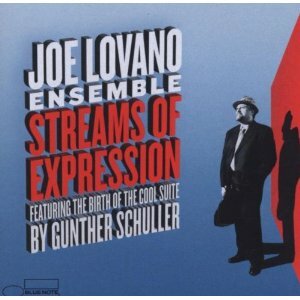 Streams of Expression reunites Lovano with the great composer, conductor, and musicologist Gunther Schuller (their first collaboration was Rush Hour, Blue Note, 1995), and draws upon everything from the cool school to late-era Coltrane, offering a holistic take on jazz, present and future. The album is comprised of two extended, multipart pieces (Streams of Expression Suite, Birth of the Cool Suite) and three stand-alone tunes (Blue Sketches, Buckeyes, Big Ben) and features an augmented incarnation of Lovano’s nonet from the albums 52nd Street Themes (2000) and On this Day . . . At the Vanguard (2003). Three of the tracks showcase Lovano in a trio setting, recalling his Trio Fascination series, regarded as a contemporary classic.